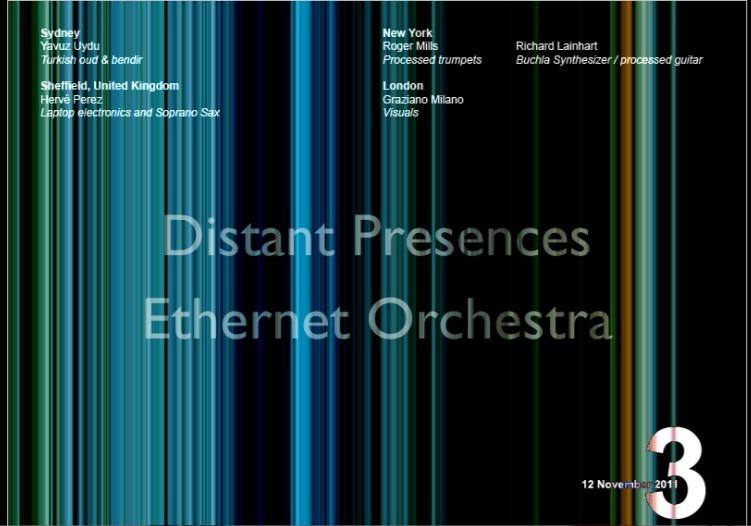 Distant Presences 3 is the third in a trilogy of live networked A/V performances by the Ethernet Orchestra, recorded in November 2011. It features Richard Lainhart (Buchla Contiumm) and Roger Mills (processed trumpet) live @ O-Town Sound, New York, Hervé Perez (Sax & electronics) in Sheffield, UK and live cinema artist Graziano Milano, London. The performance followed paper presentation by Roger Mills at ACM Creativity and Cognition Conference, Atlanta November 4-6, and a guest lecture at Pauline Oliveros’ doctoral research group on 11th November at Rensselaer Polytechnic, Albany. Richard Lainhart passed away on the 30th December 2011. Our hearts go out to Richards wife, Caroline Meyers and we send our condolences and best wishes for the memorial concert on 4th March. 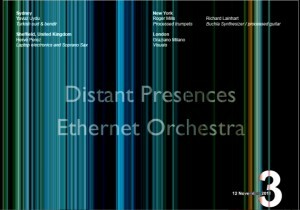 You are currently browsing the ethernet orchestra blog archives for February, 2012.